Do you want a beautiful smile? "Welcome to our Family Dental Office"
In Our Practice You Will Be Treated As Family. You Will Have The Smile That You Deserve. We Look Forward To Seeing You Soon!! WE ACCEPT ALL PPO INSURANCES ! EMERGENCIES SEEN ON THE SAME DAY! 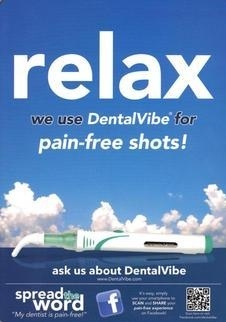 Does the fear of the needle prevent YOU from relaxing in the dentists chair? At Westward Dental Centre, we use the most updated tools and techniques to give you a pain-free experience!